Are you ready to turn your bedroom into your favorite place in your home? You’ve come to the right place. It all starts with choosing the right set for your master, guest or any other bedroom in your home. That is because choosing the right bedroom set can make all the difference when it comes to your nightly routine. Our bedrooms have become our safe havens. They are more than where we sleep. They are where we read, catch up with our spouses, watch television, check up on work, and generally just unwind from our busy days. More than any other room, our bedrooms are where we should feel most relaxed. 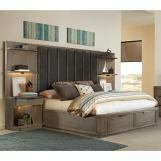 Bedroom Furniture Discounts provides you with a great way to outfit that room of relaxation for less. Purchasing multiple pieces such as your bed, nightstand, dresser and mirror (depending on your set) saves you both time and money, as the coordinating work has been done for you and you spend less than you would buying each piece separately. We have a wide number of selections to choose from, including thousands of bedroom set options. From understated headboards to eye-catching designs, to dark and light hardwood options, we have something to match every style and budget. Take a look at our gorgeous inventory and find the sets which best match your home. And with our great prices, you’ll never have to choose between style and value. Let Bedroom Furniture Discounts help you turn any bedroom into a sanctuary, whether for you or for your guests. Contact us today if you have questions about these or any other of our fabulous furniture selections.